With winter in full swing, pedestrians are more at risk of being injured by a fallen tree branch than at any other time of the year. Unfortunately, determining liability in these types of cases tends to be difficult, so many injured parties are left without compensation for their injuries. To ensure that this doesn’t happen to you, please call our office today and a member of our dedicated premises liability team will explain your legal options. 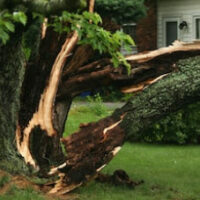 Whether an injured party can recover damages after being struck by a falling tree branch depends on a number of factors, including what caused the incident and whether the tree was located on private or public property. For instance, if a person is hit by a falling tree branch in a public park, any resulting personal injury case should be filed against the city or the company hired by the city to prune and otherwise maintain the trees. Unfortunately, holding a government body liable for negligence is difficult, as plaintiffs are required to comply with a series of complicated procedural and substantive rules. For example, those who are injured due to governmental negligence must file notice of an intention to file a claim within three years of the incident, after which, plaintiffs must wait an additional 180 days for the government to conduct an investigation. Even when successful, plaintiffs who file government claims will be limited as to the amount of damages that they can collect. If, on the other hand, a tree was located on private property, then liability for a fallen branch will depend on who actually owned the tree. Under Florida law, when a tree trunk is located wholly in one person’s yard, then that individual is solely responsible for maintaining it and conducting regular inspections, so if a neighbor or pedestrian is injured by a falling branch, the property owner where the trunk is located can be held liable for damages. Alternatively, if the trunk is divided by the property line of two or more people, all of the associated property owners share equal responsibility for maintaining it. In these cases, injured parties may be required to file suit against multiple parties, each of whom can be held liable for a portion of the damages. Even when a person is injured by a falling branch, he or she is only likely to recover damages if the injury is relatively serious. Minor scratches and bruises, for example, are usually not enough to support a personal injury claim based on a failure to maintain the trees on one’s property. Providing documentation of all injuries is also crucial to the success of a case. This could include copies of medical records, photographs of the injuries, medical bills, doctor’s notes, and the results of lab tests and x-rays, all of which can be used to prove that an injury was severe enough to warrant compensation. To speak with one of the dedicated lawyers at Boone & Davis about your own case, please call 954-566-9919 or send us an online message today.